Now with one flight under our belts and a clear sky above our heads, we went out on Tuesday (15th January) with optimistic hopes. We had, once again, got the “all clear” and rumours had started spreading about a low band of pressure coming in for the next couple days, making today a very important day to get a nice flight in. 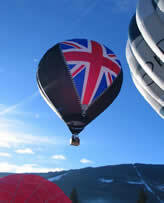 So we inflated the balloon and sent up David and Sue from Alba Ballooning along with Pete Forster the pilot. Armed with 6 gas tanks they flew for a total of 2 hrs 52 minutes getting in a total of 52kms in that time. After Tam and myself found the balloon, we packed it up and travelled back to Filzmoos to gas up and debrief. That evening we went out for drinks with our British friends. They had just purchased a new Lindstrand Balloon (British Flag) and had just given its first flight on Monday, so their morale was high. However our energy levels were low, so after a quick drink and something to eat we went back to the apartment to catch up on some sleep. If you like the sound of a long-haul balloon flight in Cornwall, check out our flight availability on our website. You will be sure to find something spectacular either for yourself or as a gift for your loved one.